Have you ever been forced to coordinate an event? If so, you should understand how complicated the process can truly be! Event coordinators need to follow a strict procedure, in order to ensure that the event is properly scheduled and all attendees are notified of the event. Once the day has finally arrived, this individual will need to keep track of those that have came, as well as those that have left. This is where the sign in & sign out sheet template comes into the picture. Within this comprehensive guide, you will learn all about this document and its benefits. First and foremost, it is good idea to familiarize your self with the basics of the sign in and sign out sheet. Although it is possible to customize this document to suit your needs, it generally follows a similar pattern. Below, you will find some of the items, which are commonly found on the sign in and out sheet. Although the document can be utilized to keep track of the comings and goings of people, it can also be used to track rentals and other items. 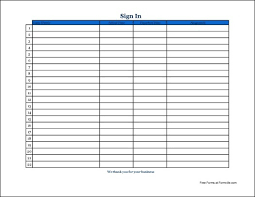 Below, you’ll explore some of the most common uses of the sign in & sign out sheet template. Renting out items can be enormously frustrating and complex. Take a library for instance. This type of facility is responsible for maintaining and keeping track of thousands of different titles. They’ll need to take note each time a guest visits the facility and either returns or borrows a book. Utilizing a sign in and sign out sheet in this scenario is immensely wise. The document will give you the ability to maintain records of who borrowed what and when. When a book is overdue or has gone missing, you’ll be able to refer to the document and instantly discover who has it. A doctor’s office can be a very hectic place. These establishments are required to deal with innumerable sick individuals day in and day out. Once a patient arrives, the receptionist needs to take note of their presence, so they can relay the information to the doctor. Once the doctor has finally agreed to see the patient and they’ve left, the receptionist needs to record this activity, so they do not accidentally call on the same patient again. This is why it is a good idea to use a sign in and sign out sheet. This document will give the doctor and receptionist the ability to keep up with their workload, as well as the activities of their patients, so their business and run as smoothly as possible. Teachers and principals may very well have the most crucial job in the world. Their responsibilities become even more complex, when they’re required to take their students on a field trip. Again, the sign in and sign out template can be very helpful in this type of situation. With the document, these professionals will always know precisely where their students are supposed to be. Although the document itself might be simplistic, it can actually be enormously advantageous in a wide array of situations. Whether you’re a teacher, doctor or librarian, you should contemplate utilizing this document today, so you can better keep track of your belongings, patients or students!